I often pass Tang’s Donut on Sunset Blvd, which is open 24 hours every day, and although I have never gone in(not so big on donuts and donut related products these days, even though this is my second post about donuts on here in the last week), I do notice that it is absolutely poppin’ fresh when it comes to chess. It’s also mentioned on this Public Chess Spots page. Has anyone ever gone in on one of these games? Spectated? I have. When I first moved here‚Äîlike, the first week I was here‚ÄîI went there at about three in the morning and watched people play for awhile. 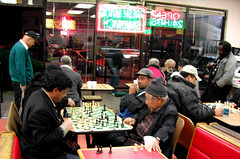 Sitting in a shop that sold donuts and ice cream watching old men play chess in the middle of the night was, at the time, incredibly surreal to me. Haven’t been for probably seven years at this point. Don’t ever play any variation of a Sicilian Defense at Tang’s. You’ll get whomped.